I cannot explain how exciting, or what an honor, it is to be working on the scenery where Thistle’s original illustrations and new ideas meet with our ideas and sketches. The Whole Botanicarium idea in turn came from seeing FPOA’s insane Green Mechanicvm. It has been a very organic creative process where the whole will be so much more than the sum of its parts. This thing is really taking of and turning into something special. I’m marveling at the amazing illustrations from Thistle, Kari and Vader (still unpublished) and the insane models and backstories from all the participants, and perhaps most special is the wealth of ideas in the works from people who have been inspired by this whole affair and have decided to create civilian Pilgrims for the event. Another excellent piece of art! It certainly captures the imagination and makes you rethink what Terra might be like in M41. I love the reoccurring theme of having pilgrims in each of the locations that have been depicted (very fitting for the project!). much less vividde and yellow as its on mi screen – the blind pilgrims are from a peter breugal …….. Awesome artwork. So much detail and so much to be inspired by. This project is really making me think about my own hobby. It’s just so inspiring. Those little pilgrims in the picture are great. Splendid, and I’m sure your scenery will be equally so. Question – is there/could there be any move to publish the art output from this project in book form? Now that would be something! Wow. Love this one Thistle! Who of us will build the scruffy giant eagle perced in the biomech tree? Somewhere in this amazingly haunting labyrinth of Terran flora lies the Daerwynne Palimpsest…hopefully. Fantastic looking piece of art! It is very evocative and thought provoking, challenging the viewer to rethink what they know of Terra. How has the terrain and flora been harnessed in the machinations of the Imperial machine? re publishing art – its all GW IP and as such it really belongs to them not me or sleet and as such its copyright GW and only appears here bi curtesy …. this is just one aspect – terran halls are endless – both in area and architecture – or is it a mystics vision or maybe a metaphor buried deep in a tome of ancient bibliotec carried bi wandering pilgryms searching for the truth …. Think this may be my favourite of the three Pilgrymage images so far. I love the massive templescapes, shrineworlds and industrial structures that appear in so much 40k artwork but it’s really nice to peel back the surface and get a look at a different part of the world. All too often futuristic farmlands seem to be almost identical to modern farmlands, with perhaps the introduction of an anti-gravity tractor and a two-headed cow. It’s inspiring to see a properly 40k-esque patch of countryside and as ever there are so many little hints and details that encourage one to ask questions about the landscape depicted (I want to know what kind of livestock they have that’s made them want to pollard rather than coppice those trees!). Oh and the little patches of fog around the road itself are wonderfully atmospheric. the biomechanical cable trees have a certain life of their own but need constant maintenance bi the botanicumme priest adepts who service these vast forests with electrosequeters and holi oil – but the deeper one treads the more dangerous it becomes …. I very much doubt that the blind pilgrims, in rags, can walk a league (3 miles) never mind ten thousand leagues to wherever it is they are bound (I suspect the pilgrymme-halls of terra. If you’re interested (I was and looked it up) the Breughel is ‘the Blind leading the Blind’ — the man in front is as blind as his four fellows so we can say they will never reach their goal. The road is narrow and cracked and although they’re hugging the side they might fall or falter. The repair-skull, as well as tying the composition to the other two of holie terra, looks up at the toiling, filthy, desperate men. It might serve a similar purpose to the skulls in Mediaeval vanitas paintings or the danse macabre, where a beckoning skeleton pointed to prince, Abbot or Pope, symbolising that they too must die. The skull looks at the pilgrymmes as if to say ”you will soon join me, quod sumus hoc eritis” [roughly what we are you will be]. The skeletons — of children, I believe — mounted on poles, the skull on the sign and the rather scruffy looking bird — which suggests to me a carrion-bird observing its next meal — indicate the fate of pilgrymmes who falter on this part of the route. Ironically or touchingly, some of the pilgrymmes, blind men, are carrying a book they cannot read, candles,whose light they cannot see and goggles, which are useless to their sightless eyes (2, 4, 5 from the left). Are these intended as pleas to the Emperor (‘Master, that I may see again’, Mark 10:51), are they kept out of reverence even though they are useless? The simple piety of these pilgrymmes makes an immense contraste with the corruption and greed of the Lady Novellis or the Hospitaliers. Touchingly, too, the cross-shaped skeleton-poles recall the roadside shrines of mediaeval Europe and I imagine they are venerated (see the Officio Sancti Exanimus article — all who die on Pilgrymage are said to be holie) by surviving pilgrymmes passing by. The Breughel blind men (and Laurence’s, of course) can be interpreted as pilgrymmes because of the staves in their hands, which are not only the mark of a blind man but also the mark of a pilgrymme to Santiago de Compostela. Other mediaeval images of palmers usually show them with a staff in hand and I believe — I am not sure — there is a reproduction staff in the Pilgrimage museum, dedicated to St Duhac, in the town of Tain, a few miles from my home. Someone pointed out the trees are pollarded not coppiced (i.e. the topmost branches pruned back to encourage straight, vigorous growth). It’s interesting to think of the wildlife that might dwell here. I found a single pollard oak walking stick in an auction online and it occurs to me that staves could have once been fashioned for the pilgrymmes as a memento of terra, to be sold in the markets, here, as well as being a place of research, but it too is overgrown and decaying, , strange growths in the mist (?? or yet more incense that covers terra, from millennia of censers, or both? )and pollarded trees far too high to be made use of, the sign is filthy and barely legible. The strange biomechanical trees, twisted, ending in a plain skull are very od. Are they some forbidden experiment? 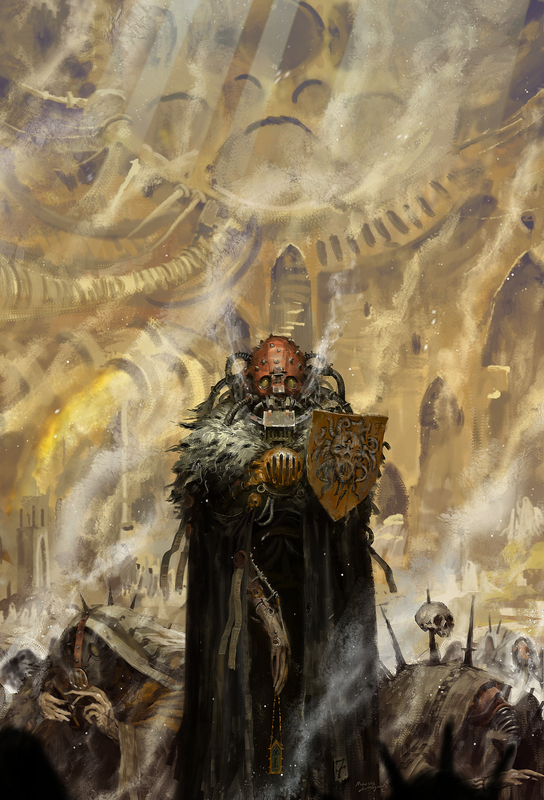 Have the very trees grown in sympathy to their bio-mechanical master of the golden throne, a fusion of living flesh and machine as much as the corpse, yet living God of the Imperium is. Yet the golden glow gives it a strange beauty, the beauty of the temple-world of Terra, the beauty of sacrifice and death. Sorry for all the rambling, another beautiful painting. Seeing Laurence’s remark about the Botanicumme trees makes the analogy to the Emperor more pertinent — they have a life of their own but need to be constantly sustained by their priesthood much as the Emperor needs lives to sustain him. The fact that the forestes are still maintained, but less and less as the deeper one goes, is much better than them being simply dead — it recalls the dim and failing knowledge of the Mechanicvm, the machines and reliques that dare not be touched for fear they fail, the slow decay and darkness as the priestehoode withdraws…. Wonderful work, laurence. blimey mr gray you ought to write a book …..
High praise from the Magister Gothici Punki (dog High Gothic in the extreme — punkus genitive punki, second declension !!!) himself, and I’m honoured, but no the credit is yours. you’re the master sir, you produce these strange, wierd, haunting and beautiful works. If they chime in my soul (as your miniatures do to — they’re masterful) and I describe even a tenth of what you’ve put into them then I do well out of the deal. Rather worried (I have a decidedly scrupulous character) that some offence might hang around ‘do well out of the deal’ as if it belittles the quality of your work as true art — should probably stop brooding on these things. I meant only the highest praise, saying that I don’t feel the merit — if there is merit, which I am surprised and gratified to find such capable people find in my thoughts, quite a confidence boost — of my scribblings is entirely my own, you deserve the lion’s share as it is your work that provokes them. It really is an utter delight to study your paintings, 2- or 3d. Cheers — scrupulosity is a sort of religious variant on OCD. Not pleasant — sorry if it was rather odd. Lovely illustration, as always. The vast distance and difficulty makes the pilgrimage all the more worthy. Pilgrymage and penance have always been intimately linked in this world – you’re right, I think, in identifying a link here. Cf 3 of the 4 murderers of St Thomas Becket going to the Holy Land. For the devout in the Imperium, a death on Pilgrymage seems to expunge all sin (if the reliques of the pilgrymmes are sold as saints’ relics). Much the same thing was believed of Iona in the time of Shakespeare’s Macbeth. This is so inspiring! I haven’t been this excited for a model project since Jake & Dinos chapmans rendition of hell. This is a riff on a Dore print from London a pilgrimage …… A very Dickensian book – I look at things thru a Imunda filter most of the tyme ……. Gorgeous! I love the rich golden saturation in all of these. As decrepid and twisted as these terran landscapes (or I suppose they they may be cavernous interiors) are they are still gilded and ornate. At first glance I read the sweeping tree as some type of galleon, which is also cool. im in the same space issac – yesterday i was looking at saxon costumns in the norwich castle museum and so today im itching to doodle scrath …. Anglo saxons — interesting inspiration. Not typical… looking forward to seeing anything you publish.